Eleider ‘Storm’ Alvarez (24-0, 12 KOs) dethroned WBO light heavyweight champion Sergey ‘Krusher’ Kovalev (32-3, 28 KOs) in halting the 35-year-old Russian knockout artist in the 7th round on Saturday night at the Hard Rock Hotel & Casino in Atlantic City, New Jersey. Alvarez knocked a sloppy Kovalev down three times in round seven to get the stoppage. The fight was waived off after the third knockdown by referee David Fields. The official stop time of the match was at 2:45 of round seven. It was a good fight for the 34-year-old Alvarez, who waited Kovalev out until the 7th before he started landing his big shots. Alvarez had obviously studied the blueprint created by Andre Ward in how to beat Sergey. Alvarez did the same thing Ward did in waiting until Kovalev was tired before taking the fight to him. The difference was that Alvarez head-hunted Kovalev, whereas Ward targeted his midsection to score a stoppage. Kovalev’s loss puts his career in serious doubt. He’s now lost three out of his last five fights, and it’s not looking good for him. You can argue that Kovalev never deserved to be the WBO champion in the first place, as he won the vacant title in beating what was initially a tune-up level opponent in Vyacheslav Shabranskyy last November. After Ward vacated his WBO title and retired, Kovalev’s promoters at Main Event petitioned the WBO to have the vacant WBO title on the line for the Shabranskyy fight. As such, Kovalev was able to fight a tune-up level opponent for the WBO title instead of being forced to face a talented contender like Marcus Browne or Eeider Alvarez. Before facing Kovalev last year for the vacant WBO title, Shabranskyy had been stopped by Sullivan Barrera. In Kovalev’s first defense of his WBO title, he beat fringe contender Igor Mikhalkin. Again, this was another weak opponent for Kovalev, and he did well in stopping him in the 7th round. The loss for Kovalev against Alvarez once again exposes him as having a shaky chin and poor stamina. It’s unclear where Kovalev goes from here. Now that the top fighters at 175 know his weaknesses, he’s a sitting duck for anyone that is smart enough to follow Ward’s blueprint in how to beat him. In the co-feature bout, World Boxing Association 175 pound champion Dmitry Bivol (14-0, 11 KOs) had too much youth, variation and too high of a punch output for former light heavyweight world title challenger Isaac Chilemba (25-6-2, 10 KOs) in beating him by a 12 round unanimous decision. 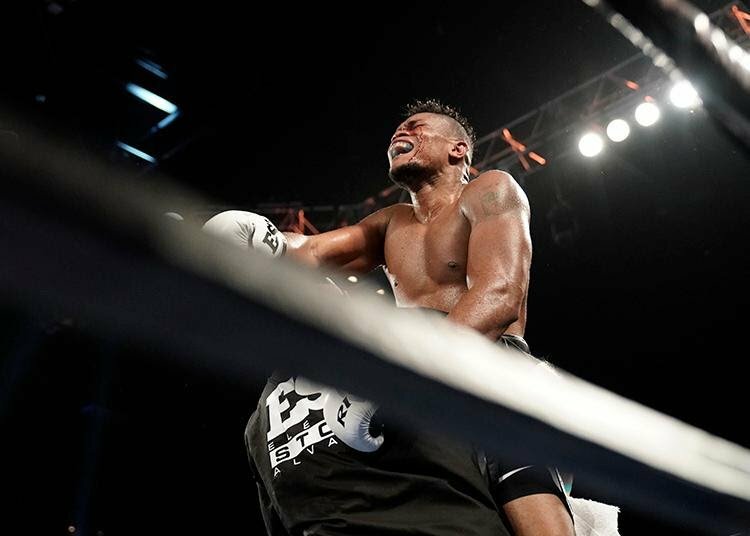 The serviceable 31-year-old Chilemba put up a game effort, but he couldn’t avoid losing his fourth fight in his last five outings. For a fighter with a record as horrible as Chilemba’s, he put in a pretty good performance. The judge’s scores were 116-112, 120-108 and 120-108. Boxing 247 scored the bout for Bivol by a 120-108. As good as Chilemba was, he simply didn’t do enough to give him more than one round. He was too negative during the contest. Chilemba fought more like a champion sitting on a wide lead rather than a down in his luck challenger coming into the fight with a 1-3 record in his last 4 fights. Chilemba didn’t press the issue with the 27-year-old Bivol the way he needed to for him to have a chance of winning. But even when Chilemba did take the fight to Bivol, he was eating punches and not landing with enough power to give him the rounds. Chilemba’s lack of punching power and his failure to pressure Bivol is ultimately what cost him the contest. It’s unclear whether Bivol suffered a right hand injury in the fight, because he stopped using that hand in the second half. Most of everything Bivol was throwing after the first half of the fight was left hands. Without a doubt, Bivol fought much better in the first half of the contest than he did in the second half. Like in his previous fight against Sullivan Barrera, Bivol’s power seemed to be a lot better in the first six rounds than it was in the later stretch of the fight. Bivol clearly lost power on his punches when he started tiring in the last six rounds. It looked like Bivol decided that he was going to just box Chilemba after the first 6 rounds. Bivol didn’t show any sense of urgency to try and score a stoppage the way that Oleksandr Gvozdyk had in stopping Chilemba in the 8th round in 2016. Of course, Chilemba was injured for the Gvozdyk fight, so that had a bearing on the stoppage. Tonight, Chilemba looked completely healthy, and he wasn’t going to be knocked out for anything. It would have taken a lot for Bivol to have stopped Chilemba tonight with the way he was taking shots. It wasn’t the type of performance from Bivol that will create a demand for him to face newly crowned World Boxing Organization light heavyweight champion Eleider Alvarez or face the other champions in the division in Adonis Stevenson [WBC] or Artur Beterbiev [IBF].